Sabah, the second largest state in Malaysia being an island is famous for its wildlife, its tea, the rainforests and the coral reefs. Very fortunately, I was a small part of a whole week’s trip to this magnificent living world completely surrounded by marine life and miraculous water on all its sides. As I boarded the plane and waited for the crew to finish their demonstration my imagination piloted its way into how my week would turn out to be. While I was still occupied with my flight of fancy ideas my fellow passenger and a dear friend got talking about the itinerary that was planned for the 11 of us that were on the trip. Stating the obvious, it being an island I must’ve expected to experience a lot of water sports during our stay. To all the non-swimmers reading this you’d definitely understand as to why I hadn’t thought about it all along. Aqua-phobic was not what I was. I realized I didn’t have the fear when and as I would be okay with getting anywhere near water as long as I was made sure that I wouldn’t drown and die. As we landed and made our way into the luxurious Sutera Harbour resort for an overnight stay the magnanimous sunset from my room and the calmness of the Harbour made me forget all about the following day’s rafting experience that we were scheduled to tackle. The following day all of us were early birds as the shuttle trip to the Kedamaian River was 2 hours long. 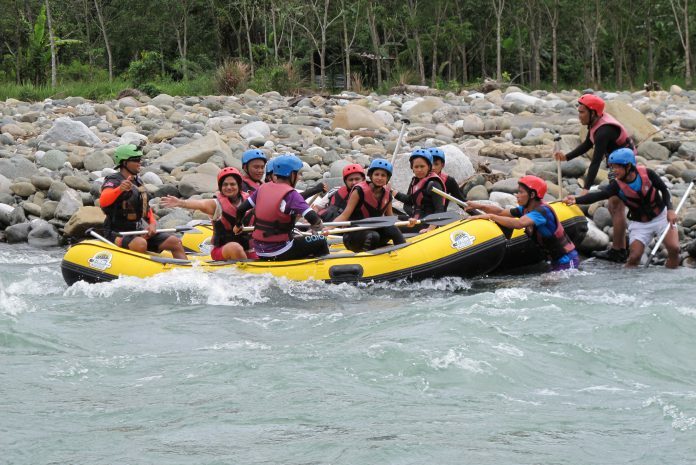 The fear remained as it was my first rafting experience, however, I was thrilled about the whole white water river rafting as the scenic view of the mountains covered by fog was to die for. I was jerked awake from sleep when the shuttle hit a pothole and the view surrounding me was something unheard of. The purity of the mass mountains away from the chaotic city life was so very dynamic that I teared up watching nature’s elegance. We reached the destination and came in contact with our guide who told us how it was a 10km ride and was graded to be level 1-2. I was relieved as he mentioned that it was relaxing and moderately adventurous and how even children did it and was great for beginners. I was strapped in to a life jacket ( this is mankind’s greatest invention according to a close acquaintance who is, by the way, a great swimmer ) and a helmet around my head was fastened I watched and listened closely as he instructed us and a chill ran down my spine when he mentioned how the rafting boat would invert at times . He further directed us as to what must be done when that happens and then we were all set to go. Read the full story at Chandni Aiyama	page.